A reflection across the work of Cecilia Vicuña on the meaning of being indigenous and the questioning of the colonialist gaze that has conditioned the relationship with our natural and race roots. Una reflexión a través de la obra de Cecilia Vicuña sobre el significado de ser indígena y el cuestionamiento de la mirada colonialista que ha condicionado la relación con nuestras raíces naturales y raciales. From the time I first met Cecilia Vicuña (b. Chile, 1948), I was awakened to a deep curiosity about the Andean indigenous universe that has for millennia inhabited the geographical region where I grew up, central Chile’s Aconcagua Valley. Her work began, coincidentally, in the year 1966, at the mouth of the Aconcagua River, in Concón. Back then I wasn’t even born, but it was in my first conversations with Vicuña that I began recognize myself in those places to which she’d paid homage over more than fifty years of artistic evolution, in the form of a life dedicated to listening to the voices of Chile’s ancient peoples. As I get deeper and deeper into her work, and as I see my own consciousness expand, the more I am able to relate to my own land. I wonder what it means to be indigenous: Must you have indigenous blood to share in its worldview? Or—more than ever today—is being indigenous a consciousness? Every day in the news, we see a scenario in which global warming is increasingly real. But indigenous nations, thanks to their deep understanding of the union between nature and the human, provide a global example of care and respect for the environment. It’s encouraging to see how in the last fifteen years—despite being violently harassed by corporations and multinationals—it has been indigenous activists who have created a way forward, preventing even greater environmental disaster through natural-resources stewardship planning, ancient knowledge and, above all, by defending their territories. Cecilia Vicuña. About to Happen. Precario (2017). Photo: Alex Marks. Image courtesy of the artist and The Center of Contemporary Art of New Orleans. Cecilia Vicuña. About to Happen. Precarios (1966-2017). Site specific installation of 117 found objects (stones, shells, glass, wood, plastic, etc). Image courtesy of the artist and The Center of Contemporary Art of New Orleans. Photo by Alex Marks. The nullification of this model of indigenous thought has spread to other spheres of knowledge to the point of convincing us that everything linked to the indigenous world was primitive and backward. 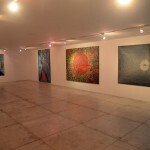 This goes entirely hand-in-hand with the invisibility to which Cecilia Vicuña’s work has until very recently been subject in the contemporary art scene, since a nullification of the indigenous contribution to the history of the Western Hemisphere is based on a nullification of the majority of the sources from which Vicuña’s artworks are nourished. 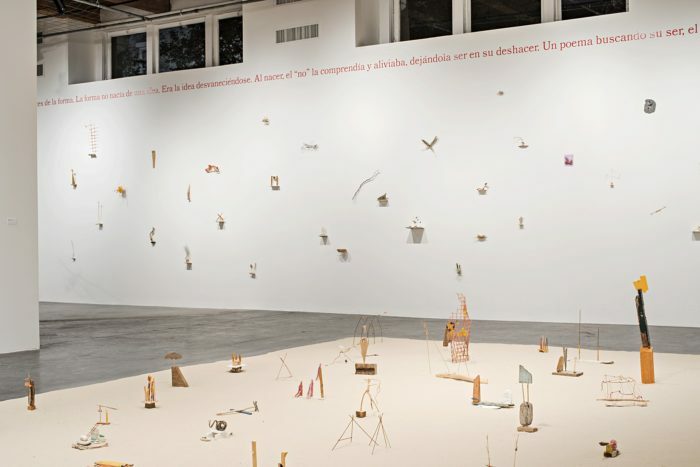 Thus exhibitions such as About to Happen, her first large-scale show in the United States and currently on view at the New Orleans Contemporary Arts Center, as well as her participation in Documenta 14, take on major significance with regard to the near future. 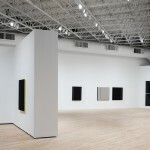 As the About to Happen curatorial text points out, Vicuña’s work reframes de-materialization as something beyond a formal outcome of 1960s-era conceptualism—as it is commonly understood—as well as a formal consequence of radical climate change, and in both cases as a process that molds public memory and responsibility. Lucy Lippard, who has followed Vicuña’s work very closely, writes in 2014 that Vicuña and her partner, poet James O’Hern, created a video to recuperate this collective memory and environmental responsibility by means of oral tradition. Entitled We Are All Indigenous, Vicuña added to the human family but we have forgotten it. This can be a problematic notion, Lippard asserts, in a scenario like that of the United States, where having indigenous forebears has taken on an exotic vogue. That said, the intent behind Vicuña and O’Hern’s declaration is to once again take up the indigenous thought model in order to drive the emergence of a global consciousness that can prevent environmental catastrophe. Far from being an appropriation of a thought-system or an identity, it is an urgent wake-up call. Cecilia Vicuña. About to Happen. Quipu Visceral (2017). 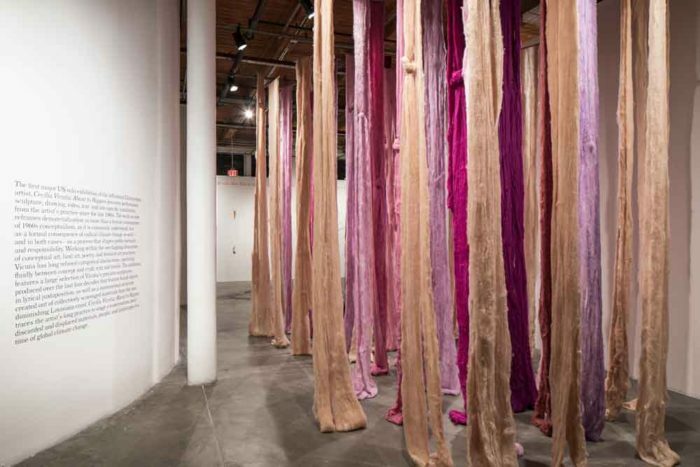 Site specific wools installation; variable dimensions. Image courtesy of the artist and The Center of Contemporary Art of New Orleans. Photo by Alex Marks. 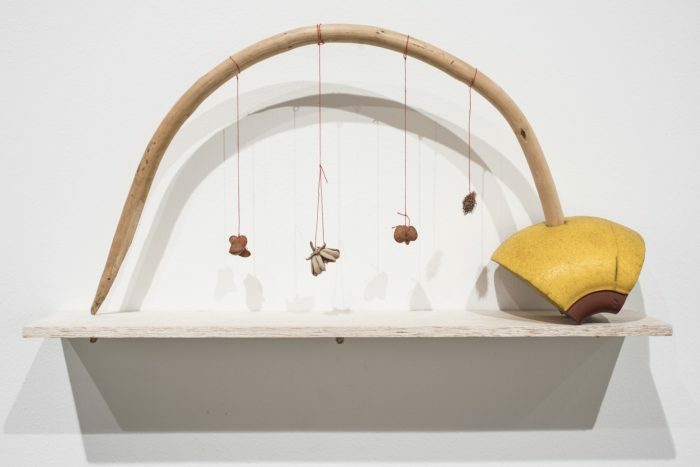 I’ve often heard people say Cecilia Vicuña appropriates elements from the indigenous world as a way to exoticize her art; I’ve even heard— in written texts—that Vicuña thinks she’s an Indian. But what ethic would impede an artist from developing indigenous-realm concepts and beliefs as a means of eliciting consciousness within us, the viewers, that could lead us to prevent global disaster? I also wonder who else could attest to the enormous crimes colonists committed when they forbade the indigenous to continue using their own names, speak their languages, and believe in their gods. I have witnessed the respect with which Vicuña approaches every place, even to pick up an apparently insignificant pile of twigs, stones, and small shells; the care she takes when she introduces herself to others; and even the way she alters her voice in presentations, so that the atmosphere she creates, rather than what she says, is what matters. Vicuña speaks constantly of listening. Her poetry, installations, and performances are not born of her intellect; rather, they are a message that reaches her in an almost medium-like fashion, via a highly archaic means of communication. Testimonies abound from people who have attended her performances or readings, and they bear witness to the trance Vicuña embodies as well as the way she transmits numerous dimensional intersections that exist in the timeframe we call the present. Vicuña’s work is future work nourished by voices of the past, or, as the artist says, ancient thoughts. Her Palabrarmás are poems where words come to life; no written phrases in the book can ever be read in the same way again. They change, they mix with new stories, they translate to other languages, and they expand or contract in sounds only Vicuña’s voice can emit. Cecilia Vicuña. About to Happen. Installation view, 2017. Image courtesy of the artist and The Center of Contemporary Art of New Orleans. Photo by Alex Marks. Cecilia Vicuña. About to Happen. Balsa Snake Raft to Escape the Flood (2017). 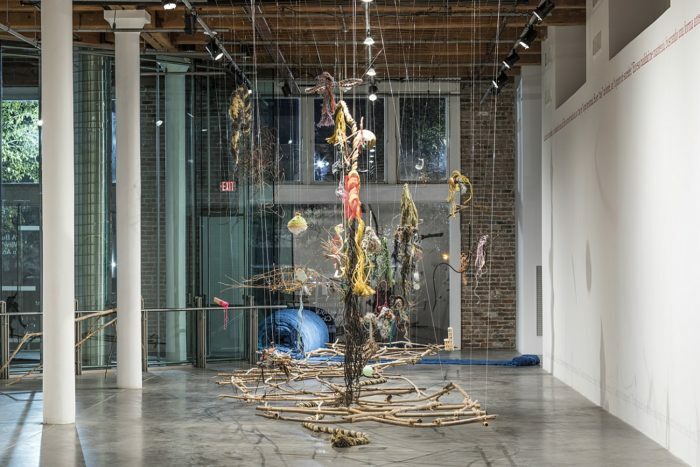 Site specific installation found materials extracted from New Orleans, Chile and New York (bamboo, debris, willows, branches, fishing lines, pearls, rope, net and feathers); variable dimensions. Image courtesy of the artist and The Center of Contemporary Art of New Orleans. Photo by Alex Marks. At the heart of her practice, there are two concepts to which her work is dedicated, both equally important: the knotted Inca weavings known as quipus, and the precarios. Both lend great value to water as a source of life. Decades earlier, Cecilia Vicuña discovered that in the time of the Incas, tactile quipus were woven from knotted cords as a means of keeping accounts. She also learned of what was called the ceque, a virtual system of forty-one imaginary lines starting out from Cuzco and extending toward the four corners of the world. The quipu and the ceque connected all communities to a totality, creating a vision of the common as something alive. A collective fabric oriented toward mountain water sources. It speaks to us of water’s tremendous importance in the Andean worldview, protecting millennia-old springs, glaciers and additionally, the places where fresh and salt water meet. 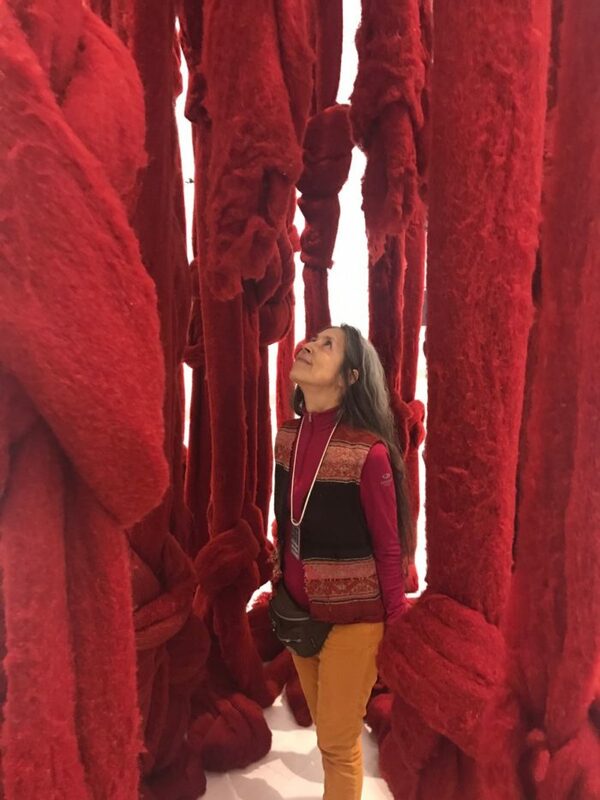 As curator Dieter Roelstraete points out, it’s possible the monumental quipu Vicuña presented at Documenta 14, made of strands of red, un-carded wool, connects the mother goddess of the Andes with the maritime mythologies of Ancient Greece. Underlining climate change’s global scale and the planet-wide need to create a collective call for life-force, Vicuña brings a ritual practiced for years in other waters, that are in fact the same, to the Mediterranean. With regard to the precarios, Cecilia created the name Arte Precario as an independent, autonomous category for her work in the mid 60’s. While not from the Andean realm, it does have an immense poetic force that clearly permeates all existence, in every direction. Her Precarios are small-scale sculptures made from discarded objects that are at once fragile and grandiose. They are portraits of life’s precariousness, of the ephemeral, the transitory, and the transcendent. While the first Precarios were created in the 1960s and installed at the shore in Concón, to be washed out to sea, they should be seen as a work in progress from which the concept that gives them their name emerges. 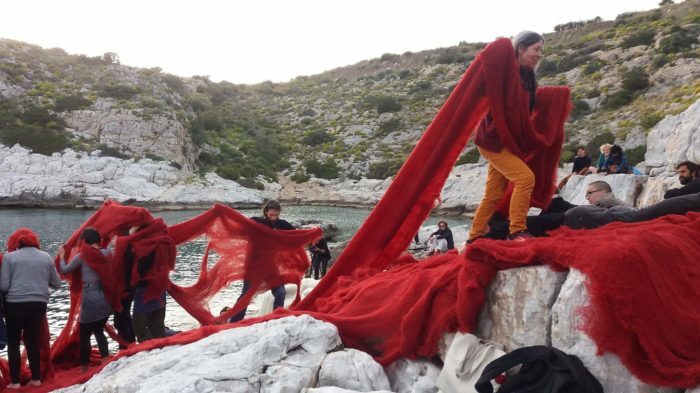 Just as Vicuña’s participation at Documenta 14 is dedicated to The Story of the Red Thread , About to Happen is dedicated to the discarded, whether this may be people, objects, or stories. For that reason, the exhibition includes a large gallery filled with small-scale Precarios as well as a monumental structure created by a collective gathering of materials from the coast of Louisiana that resembles a raft, or rather a structure that might stay afloat for a minute or two and then dissolve into the current. Dissolution is also an element that moves through Vicuña’s artistic practice, specifically one’s un-making in order to unify with some other whole. What happens when the future is not something out there, but rather, something that comes from the past, from listening to our ancestors or from the force of archaic world-visions? There are different ways to be indigenous. Cecilia Vicuña embodies the strength of her Diaguita-nation forebears from the north of Chile, as well as that of her Basque-Irish origins and that of her Spanish family that reached Chile in the seventeenth century, perhaps the start of her mixed-race heritage. Maybe that strikes those who feel indigenous thought can only be transmitted by blood as pertinent, but returning to one of my initial questions, what does it mean to be indigenous? At Cecilia Vicuña’s performances—and even just listening to one of her improvised songs in some corner of Chile’s central valley—I’ve been able to hear my ancient thoughts, the voices of those who’ve occupied these lands for thousands of years, that still live in me and in all of us. 1. Lynn White, Jr. as quoted by Cecilia Vicuña in the exhibition catalogue entitled Cecilia Vicuña: About to Happen (The Siglio Press in partnership with the New Orleans Contemporary Arts Center, 2017): 115. Translator’s rendition of Castro Jorquera’s Spanish-language paraphrase. 2. In an interview with Julia Brian-Wilson, published in Cecilia Vicuña: About to Happen, op. cit., 110. Translator’s rendition of Castro Jorquera’s Spanish-language citation. 3. Curatorial wall text at Cecilia Vicuña: About to Happen. New Orleans Contemporary Arts Center, 16 March-18 June 2017. Andrea Andersson and Julia Bryan-Wilson, co-curators. Translator’s rendition of Castro Jorquera’s Spanish-language citation. 4. Lucy Lippard, Floating Between Past and Future: The Indigenization of Enviromental Politics, op. cit., 130. 5. Andrea Andersson, Vicuña in Retrospect, op. cit., 124. Translator’s rendition of Castro Jorquera’s Spanish-language citation. 6. Dieter Roelstraete, documenta 14 catalogue. 7. In fact, Vicuña’s documenta 14 participation was entitled “The Story of the Read Thread.” However, a typographical error—read instead of red—ended up so insistently repeated that the artist ultimately decided to maintain it. The story is in fact dedicated to the red thread found throughout Vicuña’s work. At age of six, the artist learned of a little boy popularly known as the “the mummified child of El Cerro Plomo” whom the Inca had buried at the top of the mountain that originates the Mapocho Valley (today’s Santiago). The mummy was said to grasp a red thread as an offering to life’s eternal thread, as well as to water. Desde que conocí a Cecilia Vicuña (Chile, 1948) se ha despertado en mí una profunda curiosidad por el universo indígena andino que ha habitado por miles de años la zona geográfica en la cual crecí, el Valle del Aconcagua en el Chile Central. Casualmente su trabajo nació en el año 1966 en la desembocadura del Río Aconcagua, en Concón. Para entonces yo aún no había nacido, pero fue en mis primeras conversaciones con Cecilia que comencé a reconocerme en aquellos lugares a los que ella ha rendido homenaje a lo largo de más de cincuenta años de desarrollo artístico, a través de una vida dedicada a escuchar las voces de nuestros antiguos pueblos. 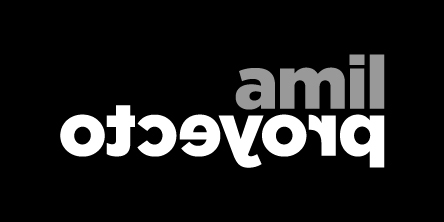 Adentrándome más y más en su obra, y viendo cómo mi propia conciencia se va abriendo en la medida en que me relaciono más con mi tierra, me pregunto ¿qué significa ser indígena? ¿es necesario tener sangre indígena para compartir su cosmovisión? o ¿es que ser indígena hoy, es más que nunca una conciencia? Podemos ver en las noticias de cada día, en un escenario donde el calentamiento global es cada vez más real, que son los pueblos indígenas los que, gracias al entendimiento profundo de la unión humano-naturaleza, están dando un ejemplo global de cuidado y respeto hacia el medio ambiente. Es esperanzador ver cómo en los últimos 15 años son los activistas indígenas, que pese a ser violentamente agredidos por las corporaciones y multinacionales, quienes están haciendo camino hacia el futuro, previniendo un desastre ecológico mayor mediante planes de manejo de recursos naturales, conocimientos ancestrales y sobre todo la defensa de sus territorios. Con la colonia, una característica central de la cosmovisión indígena de Sudamérica se perdió, la cual fue borrada mediante la evangelización y la introducción de nuevos sistemas de pensamiento. Al destruir el animismo pagano, el cristianismo hizo posible la explotación de la naturaleza en un clima de total indiferencia ante los sentimientos de los objetos naturales . El trabajo de Cecilia Vicuña se encuentra en el corazón de esta lucha, donde, como ella misma dice, “la conciencia es el mayor arte de los seres humanos, donde el acto físico de hacer performances, exposiciones y objetos es tan solo la manifestación tangible de nuestra conciencia, con la intención de tocar otras formas de conciencia” , y abrir paso a un entendimiento que vuelva a hacernos sentir como un todo unido a la naturaleza, como un nudo fundamental en el hilo de la vida. Cecilia Vicuña. About to Happen. Precario (2017). Fotografía por Alex Marks. Imagen cortesía de la artista y el Centro de Arte Contemporáneo de Nueva Orleans. Esta anulación del modelo de pensamiento indígena se ha extendido hacia otras esferas del conocimiento hasta el punto de convencernos de que todo aquello vinculado al mundo indígena era primitivo y retrasado. Este hecho va en total relación a la invisibilidad que ha tenido hasta hace muy poco el trabajo de Cecilia Vicuña en el arte contemporáneo, ya que en la anulación del aporte indígena a la historia de América radica también la anulación de una gran parte de las fuentes de las cuales la obra de Vicuña se nutre. 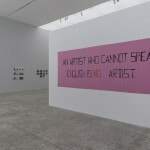 Es por esto que exposiciones como About to Happen, su primera gran exposición en Estados Unidos, actualmente en el Centro de Arte Contemporáneo de Nueva Orleans, y su participación en la Documenta 14, cobran una gran importancia en vistas del futuro que se aproxima. Como señala el texto introductorio de About to Happen la obra de Vicuña remarca la desmaterialización como algo más que una consecuencia formal del conceptualismo de los años sesentas, como es comúnmente entendido, pero también como una consecuencia formal del radical cambio climático, y en ambos casos, como un proceso que moldea la memoria pública y la responsabilidad . Lucy Lippard, quien ha estado muy cerca del trabajo de Vicuña, cuenta en su texto  que en 2014 Cecilia y su pareja, el poeta James O’Hern, crearon un video con el objetivo de recuperar esta memoria colectiva y responsabilidad medioambiental a través de tradiciones orales. Su título es We Are All Indigenous (Somos todos indígenas), al que Vicuña añadió to the human family but we have forgotten it (en la familia humana pero lo hemos olvidado). Esta noción puede ser problemática, asegura Lippard, en un escenario como el de Estados Unidos en que tener ancestros indígenas se ha transformado en una especie de moda exótica. Pero la intención detrás de esta declaración hecha por Vicuña y O’Hern es la de retomar el modelo de pensamiento indígena para hacer emerger una conciencia global que impida el desastre medioambiental, muy lejos de ser una apropiación de un sistema de pensamiento o de una identidad, es un llamado de urgencia. He escuchado muchas veces decir que Cecilia Vicuña se apropia de elementos del mundo indígena como un modo de exotizar su arte, he oído incluso decir que Cecilia se cree india, en palabras textuales, pero ¿qué tipo de ética impediría que una artista pueda desarrollar conceptos y creencias del mundo indígena, con el fin de despertar en nosotros, espectadores, una conciencia que pueda llevarnos a prevenir un desastre global? Me pregunto también, ¿quién pudo darse cuenta entonces del gran crimen que los colonos cometieron al prohibir a los indígenas seguir usando sus nombres, hablar su lengua y creer en sus dioses? He visto el respeto con el que Vicuña se acerca a cada lugar, incluso a recoger un montón de palitos, piedras y conchitas aparentemente insignificantes; el cuidado que tiene al presentarse ante los otros, incluso el modo en que cambia la voz en sus presentaciones, al punto de no importar ya lo que está diciendo sino la atmósfera que crea. Vicuña habla constantemente de una escucha. Su poesía, instalaciones y performances no nacen de su intelecto, son más bien un mensaje que llega a ella de manera casi mediúmnica (a través de un modo muy arcaico de comunicación). Son muchos los testimonios de personas que han estado presentes en sus performances o lecturas que dan cuenta del trance que Vicuña encarna, y el modo en que transmite los múltiples cruces dimensionales que existen en este tiempo que denominamos presente. La obra de Vicuña es una obra futura, que se nutre de las voces del pasado, o como ella dice, de los pensamientos antiguos. Sus Palabrarmás son poemas donde las palabras cobran vida, y ninguna de las frases escritas en el libro vuelven a ser leídas igual, cambian, se entremezclan con nuevas historias, se traducen a otras lenguas y se dilatan o contraen en sonidos que sólo su voz puede emitir. No debe sorprendernos que al ver las diferentes instalaciones de Cecilia Vicuña nos encontremos una y otra vez con los mismos elementos, como si en la repetición constante de esos materiales, encontrados o elaborados en su entorno urbano y/o la naturaleza, estos fueran regenerando la vida, oxigenando nuestra sangre como en una profunda meditación purificadora que nos permite conectar con otras fuentes de conocimiento. Materiales como lana, palitos de bambú, escombros, ramas, hilos de pesca, cuerdas, redes, plumas, están siempre sobre la mesa de su estudio, así como libros, sean hechos por ella o para el estudio de los más diversos temas, y palabras, muchas palabras escritas en papelitos. Como bien resume Andrea Andersson, curadora de About to Happen, “cada nuevo trabajo es un registro de un trabajo o acto anterior en una larga práctica de revisión perpetua” , un desdoblamiento constante entre hacer y deshacer. En el corazón de su práctica hay dos conceptos a los que está dedicada su obra, ambos de igual importancia, el quipu y lo precario, ambos a su vez dando un gran valor al agua como fuente de vida. Décadas atrás, Cecilia Vicuña supo que en tiempos Incas ellxs tejieron quipus táctiles de cuerdas anudadas para hacer cuentas, y un ceque, un sistema virtual de cuarenta y un líneas imaginarias que nacían en el Cusco y se proyectaban hacia las cuatro esquinas del mundo. El quipu y el ceque conectaban a las comunidades en un todo, creando una visión de lo común como algo vivo. Un tejido colectivo orientado a las fuentes de agua en las montañas. Esto nos habla de la tremenda relevancia que el agua tenía en la cosmovisión andina, protegiendo sus fuentes milenarias, los glaciares, y también los lugares de encuentro del agua dulce y el agua salada. Quizá por esto, el quipu monumental hecho de hebras sin cardar de lana roja, presentado por Vicuña en la Documenta 14, conecta, como señala su curador Dieter Roelstraete, la diosa madre de los Andes con las mitologías marítimas de la antigua Grecia . Reforzando la escala global del cambio climático, la necesidad planetaria de crear un ruego colectivo por la fuerza vital, Vicuña lleva al mar Mediterráneo un ritual que ha realizado por años en otras aguas, que son la misma. Respecto a lo precario, Cecilia acuñó el nombre Arte Precario como una categoría independiente y autónoma para su trabajo a mediados de los 60s, que no viene del universo andino, pero que tiene una fuerza poética inmensa, que atraviesa sin duda toda la existencia, en todas las direcciones. Los precarios son pequeñas esculturas hechas de objetos descartados, frágiles y grandiosas a la vez. Éstas son un retrato de la precariedad de la vida, de lo efímero, de lo transitorio y lo trascendente. Aunque los primeros precarios fueron creados en los años sesentas, instalados en la orillas del mar en Concón para que éste se los llevara con el oleaje, estos deben ser considerados como una obra en curso, desde donde emerge el concepto que los nombra. Así como la participación de Cecilia Vicuña en la Documenta 14 está dedicada a la Historia del hilo rojo , About to Happen está dedicada a lo descartado, sean personas, objetos, o historias. Es por eso que en esta exposición hay una gran sala llena de pequeños precarios, así como una estructura monumental creada de la recolección colectiva de materiales de la costa de Louisiana que se asemeja a una balsa o sugiere una estructura que tal vez podría flotar algunos minutos sobre el agua, para después disolverse en su corriente. La disolución también es un elemento que atraviesa la práctica de Vicuña, el deshacerse uno mismo, para unirse a otro, a un todo. ¿Qué pasa cuando el futuro no es algo que está allí delante, sino que viene del pasado, de la escucha de nuestros antepasados, de la fuerza de cosmovisiones arcaicas? Hay diferentes formas de ser indígena, Cecilia Vicuña encarna la fuerza de sus ancestros diaguitas del norte de Chile, así como también su origen basco-irlandés y a una familia española que llegó a Chile en el siglo diecisiete, que puede ser el origen de su mestizaje. Quizá esto parezca importante a ojos de aquellos que sienten que el pensamiento indígena sólo puede ser transmitido de manera sanguínea, pero volviendo a una de mis preguntas iniciales, ¿qué es ser indígena? En los performances de Cecilia Vicuña, e incluso escuchando alguno de sus cantos improvisados en algún rincón del valle central de Chile, he podido escuchar mis pensamientos antiguos, las voces de aquellos que han ocupado estas tierras por miles de años y que aún viven en mí, en todos nosotros. 3. Texto de sala en la exposición Cecilia Vicuña: About to Happen. Centro de Arte Contemporáneo de Nueva Orleans. 16 marzo – 18 de junio, 2017. Co-curada por Andrea Andersson y Julia Bryan-Wilson. 7. 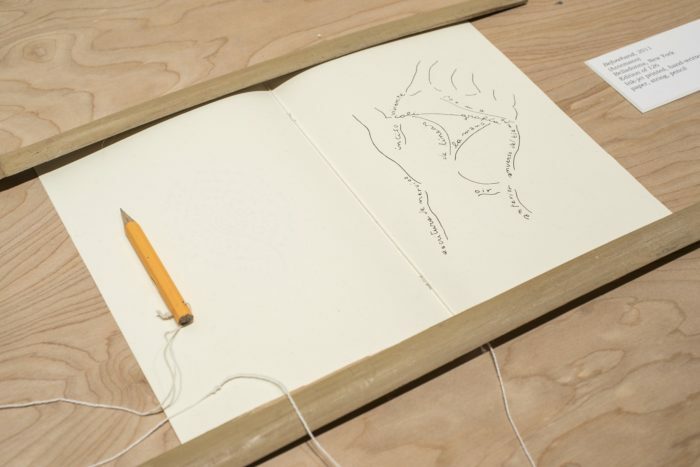 En realidad la participación de Cecilia Vicuña en la documenta 14 se llama en inglés “The Story of the Read Thread”, donde reemplazó el Red (rojo) por Read (leer) por un error tipográfico que se repitió insistentemente, hasta que la artista decidió mantenerlo. Esta historia está dedicada realmente al hilo rojo presente a lo largo de toda la obra de Cecilia Vicuña, quien a los 6 años supiera de la existencia de un niño llamado popularmente “la momia del plomo”, enterrado por los Incas en la cima de la montaña que da origen al Valle del Mapocho (hoy Santiago), con un hilo rojo en su mano como ofrenda al hilo eterno de la vida, como ofrenda al agua.